What would become the Littlefield Fountain was once envisioned as a larger gateway to UT, complete with 37-foot obelisks housing President Woodrow Wilson and Jefferson Davis. After months of controversy swirling around the statues memorializing Confederate leaders on UT’s campus, the group tasked with helping President Greg Fenves decide their ultimate fate handed up their recommendations on Monday. The statues have rankled many a Longhorn over the years – they’ve been vandalized 11 times in the last decade alone. However, the original plans — one of which involved constructing a 40-foot, Confederate-exclusive memorial archway — would’ve undoubtedly drawn considerably more controversy. Designer Pompeo Coppini panned George Littlefield's idea of an archway, and later spoke out against the memorializing of Confederate leaders in a letter to Littlefield. The statues' placement recently came to the fore after a racially-motivated shooting in Charleston prompted a national discussion on Confederate imagery. But, the statues of Jefferson Davis, Robert E. Lee, Albert Sidney Johnston and John H. Reagan drew ire when the South Mall memorial was first envisioned by George Littlefield in 1918. On the top of the Arch I wish them to place a life size statue of Jefferson Davis, the President of the Southern Confederacy, to his right and below him I wish them to place a life size statue of General Robert E. Lee, Commander of the Army of Virginia, to the left of President Davis and below him and opposite the statue of General Lee, I wish them to place a life size statue of General Albert Sidney Johnston, Commander of the Army of Tennessee. Under General Lee I wish them to place a statue of John H. Reagan, Postmaster General of the Confederacy, and below the statue of General Johnston a statue of James S. Hogg, the peoples’ governor of Texas. The aforementioned arch would’ve been a “massive bronze arch over the south entrance to campus,” Littlefield said. It likely would’ve obstructed the view of the Victorian-Gothic main building – the building that preceded the UT Tower. But the arch also served as a sort of powerplay for the former Confederate major. Littlefield wanted to consolidate the university’s campus around the 40 Acres, but, at the time, UT was weighing the option of moving further west onto land proffered to the university by fellow regent George Brackenridge. Littlefield contracted Italian sculptor Pompeo Coppini for the job, having worked with him on a previous project – a statue honoring the Confederate regiment known as Terry’s Texas Rangers – which still sits on the Capitol grounds. 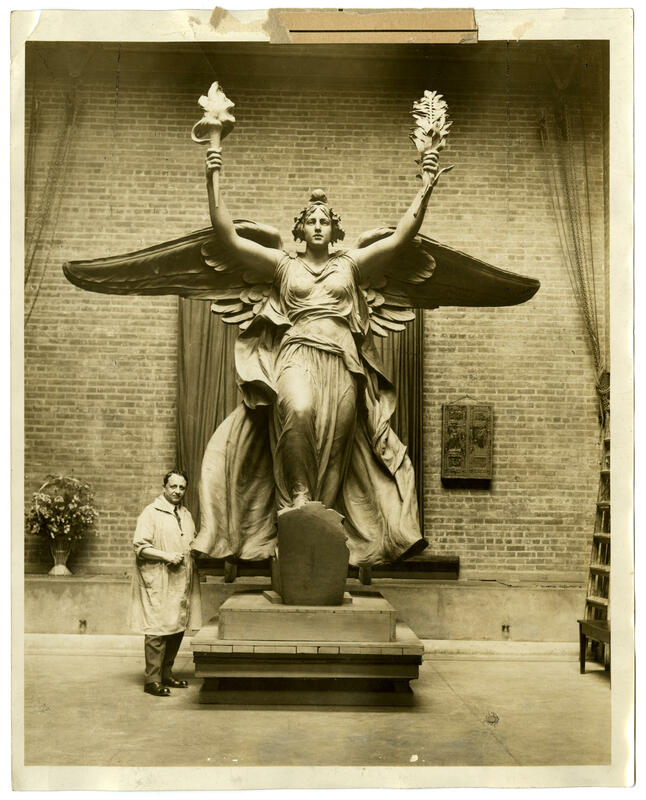 Sculptor Pompeo Coppini with Columbia, the goddess of liberty, and focal point of the Littlefield Fountain. Coppini also sculpted the controversial Confederate statues at UT, though he considered the war a "blot" on U.S. history. Coppini didn’t take to Littlefield’s arch idea or to the idea of an all-Confederate memorial, says Jim Nicar, a self-styled amateur UT historian who wrote a blog post this week detailing the memorial’s controversy. One of the three designs initially debated for the Littlefield memorial resembled Paris' Arc de Triomphe, and would've honored exclusively Confederate leaders. That repurposing was meant to serve less as a warning against the “Northernization,” as Littlefield put it, of the university and focused more on the county’s unification following World War I by featuring non-Confederates President Woodrow Wilson – who wouldn’t lend Coppini a suit to help the sculptor achieve accurate proportions in his statue – and James Hogg, the first native Texan governor. Coppini told Littlefield "the Littlefield Memorial will be resented as keeping up the hatred between the Northern and Southern states," and referred to the Civil War as a "blot on the pages of American history." Over time, the look of the memorial also evolved into an arch that more or less resembled the Arc de Triomphe with UT’s terra cotta shingles and, later, a more sprawling design that featured nearly 40-foot tall obelisks with the two war presidents, Wilson and Davis, and a large pool. 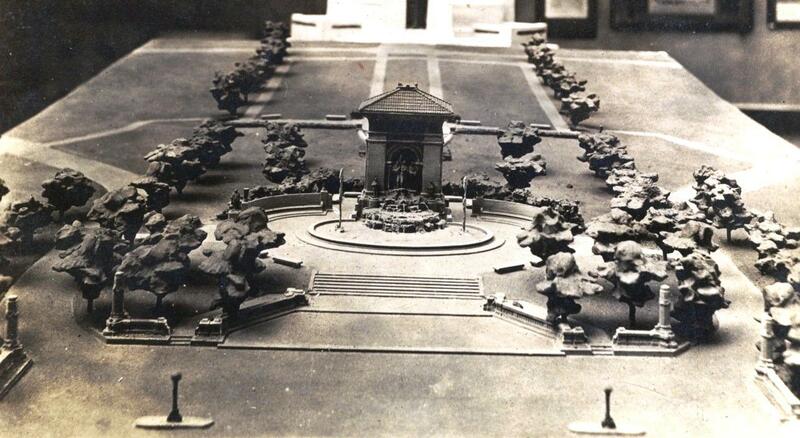 The large pool was ultimately panned and scrapped, but the centerpiece – Columbia flanked by two soldiers representing Army and Navy forces in World War I – became the Littlefield Fountain, while the statues lorded over the South Mall. 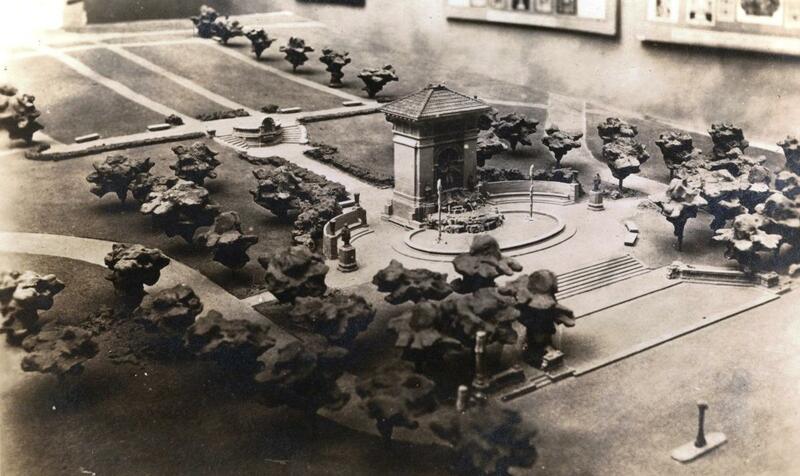 In 1933, the installation was formally dedicated. Today's Wayback Wednesday takes a look back at Guadalupe Street, before it was awash in the glow of stop lights and rush hour brake lights.